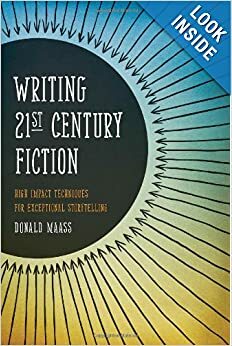 In the opening chapter, Donald Maass introduces his book’s basic premise: In the 21st century “high-impact novels utilize what is best about literary and commercial fictions,” transcending the dichotomy (pages 2-3). Maass equates “high-impact” with a novel’s inclusion on the New York Times bestseller list: the longer it stays on the list, the higher its impact. The second chapter’s title “The Death of Genre” proclaims assimilation of commercial or genre fiction into literary fiction: “A curious phenomenon has arisen in recent years. It’s the appearance of genre fiction so well written that it attains a status and recognition usually reserved for literary works” (page 13). As examples, he cites Robert Stone’s Damascus Gate — a literary and thriller; and Michael Chabon’s The Yiddish Policeman’s Union–a literary and murder mystery. Maass’s subsequent chapters present tools for writing high-impact fiction. Some of these tools are similar to those in his earlier books such as The Fire in Fiction: Passion, Purpose and Techniques. (See my review on Amazon.) Can this book be comprehended without reading his earlier books on craft? Yes. The third chapter, “The Inner Journey,” presents excerpts from several novels such as Joshilyn Jackson’s Gods in Alabama published in 2005, and Jamie Ford’s Hotel on the Corner of Bitter and Sweet, published in 2009. Can these excerpts be understood without having read the novels? Yes. Maass skillfully presents synopses of each novel excerpted. The fourth chapter, “The Outer Journey,” focuses on plot, citing excerpts from Jonathan Safran Foer’s Extremely Loud & Incredibly Close, published in 2005, and Abraham Verghese’s Cutting for Stone, published in 2009. The fifth chapter, “Standout Characters” cites examples from Markus Zasuk’s The Book Thief, published in 2005 and Lorrie Moore’s A Gate at the Stairs, published in 2009. Also Abraham Verghese’s Cutting for Stone, cited in the previous chapter, underscoring high-impact novel’s requirement of both plot- and character-driven writing. The sixth chapter, “The Three Levels of Story,” focuses on subplots, citing detailed examples of Pamela Morsi’s Red’s Hot Honky-Tonk Bar, published in 2009, and Kate Morton’s The Forgotten Garden, published in 2009. This chapter also discusses strong endings, citing J. K. Rowling’s Harry Potter and the Deathly Hallows, published in 2007. The seventh chapter, Beautiful Writing, cites many examples, including Kathryn Socket’s The Help, published in 2009; Daniel Depp’s “Losers Town” (2009); and George R. R. Martin’s A Feast for Crows (2005). In the eighth chapter, “The 21st Century Novelist,” Maass writes, “You no doubt have noticed my contempt for the three Rs of inactive literary writing: reaction, reflection, and remembering.” He cites an excerpt from Helen Simonson’s Major Pettigrew’s Last Stand, replete with three Rs and does have underlying tension. Will this chapter’s title become the title of Maass’s next book? Thanks to Maass’s persuasive comments and synopses, I have added five novels to my “must read ASAP” list: Lorrie Moore’s A Gate at the Stairs; Helen Simpson’s Major Pettigrew’s Last Stand; Jamie Ford’s The Hotel on the Corner of Bitter and Sweet; Markus Zusak’s The Book Thief; Tatiana de Rosnay’s Sarah’s Key. [The following is an appendix to the above review. The origin of literary modernism goes back to at least the early twentieth century. In a 1924 essay, Virginia Woolf wrote: “On or about December 1910 human character changed.” She was referring to an art exhibition titled “Manet and the Post-impressionists” that included paintings by Cezanne, Van Gogh, Gauguin, as well as younger post-impressionists such as Picasso and Matisse. Inspired by this movement in visual arts, fiction that’s planned to be different from traditional forms of the past, came to be created and later called modernist. The term is applied to the experimental and avant-garde writings of the early 20th century. Its techniques include: aesthetic self-consciousness and extreme subjectivity leading to unreliable narrators; stream of consciousness; interior monologue; nonlinear chronology. Modernist novelists writing in English include Joseph Conrad, James Joyce of Ulysses, Virginia Woolf, and William Faulkner. Literary postmodernism arose after World War II. It’s characterized by ironic parody, inter-textuality, the foregrounding of the process of its own creation, and the rejection of “grand narratives.” Postmodernist novelists writing in English include: James Joyce of Finnegan’s Wake, Vladimir Nabokov of Pale Fire, John Barth, Donald Barthelme, Kurt Vonnegut, Ishmael Reed, Thomas Pynchon, and Don DeLillo.